Share our NCAA 14 News & Info Central page with your friends via e-mail & social networks with this handy link http://tgt.pw/ncaa14info or by clicking Share/Save above. Game Description: NCAA Football 14 gives players more control over their fate on the field and as a head coach than ever before. The introduction of Infinity Engine 2 allows you to play true to your team with gameplay tuned with the college game in mind, while new Coach Skills and Power Recruiting create the most engrossing Dynasty experience in a generation. Add in the inclusion of the fan-favorite Ultimate Team mode which includes a number of former NCAA stars, and you have the most feature-rich entry in the history of the franchise. When does NCAA Football 14 come out? The release date for NCAA Football 14 is July 9, 2013. If you are a member of the EA SPORTS Season Ticket program, you can download the game on July 5. Best Buy - Exclusive NCAA Football Ultimate Team Big 10 Conference Pack including key Big 10 players and bonus game extension. GameStop - Exclusive NCAA Football Ultimate Team SEC Conference Pack including key SEC players and bonus game extension. Target - Exclusive NCAA Football Ultimate Team ACC Conference Pack including key ACC players and bonus game extension. Walmart - Exclusive NCAA Football Ultimate Team Big 12 Conference Pack including key Big 12 players and bonus game extension. NCAA Football 14: Prima Official Game Guide - Inside is a code to redeem for a valued NCAA Football Ultimate Team card pack with the cover athlete card, former Heisman winner Mark Ingram. Normal list price: $24.99. Currently available via Amazon for $18.75. [Price as of 6/15/2013.] 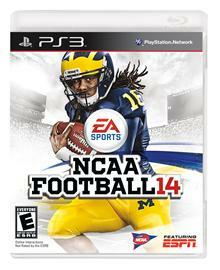 UPDATE: There will be no NCAA Football 14 Strategy Guide this year due to a licensing issue. Demo Information: The demo will be available on Tuesday, June 18. It will feature three match-ups: Virginia Tech vs. Alabama in the Chick-fil-A Kickoff, Ohio State vs. Michigan, and Oregon vs. Texas A&M. Each match-up will feature four 3-minute quarters. The demo will also feature the new Nike Skills Trainer. Playing and sharing the demo will unlock NCAA Football Ultimate Team rewards for use in the retail version of the game. Infinity Engine 2 - The Infinity Engine 2 unlocks the unpredictability and innovation of college football, bringing multiple college play-styles to life. Real-time physics. Infinity Engine utilized only in tackles last year (in Madden 13), now applies to ballcarrier as part of Force Impact System. If ball-carrier hits defender in head (stiff-arm), their head will move back. Lowers shoulder into chest, chest moves back as part of collision/hit. Applies to jukes, spin moves, hurdles, dive tackles, tackles, etc. Physics also applied to Hit Stick & Truck Stick. Ball-carrier can now make hard cuts along with foot-planting and de-acceleration on change of direction. New/additional juke moves: Left, right, back; jukes can be combo'd. Option improvements: Over 30 new pitch types (including shovel options & midline options). New playbook solely focused on spread option. "Real AI" that will "teach the AI how to run the option the right way through repetition." Revamped blocking with better targeting logic, including on bubble screens, and double teams & zone blocks. Linemen fire out to the second level more effectively if they clear LOS. Pre-snap option reads (visible with Coach Cam): See read and pitch keys. Personnel-based Playcalling. Also, in no-huddle user restricted to personnel on the field. Defensive Breakdown: As offensive player goes to make move, defender will breakdown in order to not overrun the ball-carrier and make tackle attempt. Nike Skills Trainer - Hands-on tutorial and videos for new & existing gameplay features. Kinect Integration (360) - Kinect support will be for offline play only and will be similar to what EA SPORTS has done in Madden, focusing on pre-play voice commands. NCAA Football 14 brings the game to life like never before with new additions to on-field presentation and a renewed emphasis on the story of each game. Handheld cameras capture the action from unique angles, and Brad Nessler and Kirk Herbstreit key in on impact players and noteworthy performances. Dynamic on-screen banner phrases. Also dynamic player wipes and all-new team wipes. Revamped pre-game including a live look-in from Rece Davis that sets the stage for a brand-new intro featuring vignettes, traditions, text wipes and more all set to a music video. 500+ new vignettes, plus "mic'd up players"
Enhanced commentary from Brad Nessler & Kirk Herbstreit: Focus on key players & progress through the game, drive summaries, etc. Includes long-term special storylines that may trigger after several seasons. Neutral Site Stadiums: MetLife Stadium, Soldier Field, Cowboy Stadium, M&T Bank Stadium. Updated/Authentic FBS Stadiums: Georgia State, Old Dominion, South Alabama, Texas State newly added. Includes renovations to TCU. Team specific gloves: Alabama, Maryland, Michigan, Northwestern, Notre Dame, Oregon, Texas A&M, Wisconsin. (Noticeable within game videos/screens.) Includes celebratory hand poses. NCAA Football Ultimate Team brings the fan-favorite mode to the collegiate game, allowing you to build up an unstoppable team from a collection of over 2,500 licensed former NCAA athletes. Grab new items from the Shop or Auction House, as well as picking up special edition Championship Packs, Rivalry Packs, ESPN CFL Game of the Week items and more. It’s the perfect way to experience the college football season year-round. Compete in Solo Challenges or the ultra-competitive Head-to-Head Seasons mode..
1,400 players available at release, will eventually reach 2,500. All 126 programs represented with players. Player cards may feature them as underclassmen, senior, or special Heisman Hopeful, among others. Starting the mode, players can select favorite team and will be given their uniform & stadium cards. There’s no single path to success in college football, so build up your program into a powerhouse to fit your strengths and style of play by utilizing the brand-new Coach Skills & Power Recruiting. POWER RECRUITING: Use a pool of points each week to recruit quickly and get back to the action. Points can be changed each week or set them once for the rest of the season. Locked Out: Recruits will lock out programs not within a certain point range as the season progresses. Dealbreakers: If you are below a certain level for a specific recruiting pitch that a recruit considers most important, you won't even be able to recruit him. Offseason now trimmed to just two weeks, including one last week to make a big splash and land a big commitment. Competitive/Comparative Visits: Utilize more strategy as to when you invite in recruits. If you invite a QB, you'll get a bonus for inviting an OL or WR that same weekend but two QBs in the same weekend will have a negative effect. The later in the season (and following visits to other schools) you schedule a recruit's visit, the more bonus you'll get. DYNASTY COACH SKILLS: A new RPG element to your coaching career which allows coaches to excel in specific areas. There are 18 upgradeable, multi-level skills spread across two skill trees for head coaches, as well as separate skill trees for offensive and defensive coordinators. Altogether, there are 36 upgradeable skills. Coach Levels & Coach Skills: Ramp up and earn XP by achieving goals on the recruiting trail and on the field and as well by achieving milestone records. Head Coach Skill Trees: Game Management & Recruiting. Individual skill trees for OC/DC. Coordinator skills focus on boosts to player ratings in-game. Offensive & Defensive Skills help your coordinators get the most out of your players during the game. As head coach you are in control of how every point is assigned. As coordinator, you are responsible for only the points you earned. Coaching contracts now based on program recent history vs projected (ex. Alabama expects to win 10 to 11 every season). Contract screen now tracks 30 years of each schools history... shows real life results (ex what did Wyoming look like in the 80s). In Play a Season, you take your favorite team through their full 2013 schedule. There are no off-field commitments (recruiting) to attend to so you are free to leave it all on the field.